Small sail right hand palm with metal reinforced. 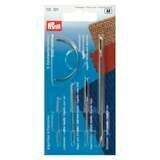 Ideal for sewing and splicing. Small sail left hand palm with metal reinforced. Ideal for sewing and splicing. Marlow waxed polyester yarn. Suitable for sewing sails and splicing lines. Diameter: 0,3 mm, Length: 92 m.
Marlow waxed polyester yarn. Suitable for sewing sails and splicing lines. Diameter: 0,4 mm, Length: 41 m.
Marlow waxed polyester yarn. Suitable for sewing sails and splicing lines. 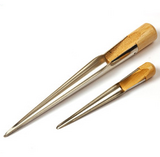 Diameter: 0,8 mm, Length 23 m.
Set of 5 needles for sails of different types. Splicing fid is made of stainless steel. Wooden handle. Total lenght 17,5 cm. Suitable for lines up to 11/12 mm. Splicing fid is made of stainless steel. Wooden handle. Total lenght 17,5 cm. Suitable for lines over 11/12 mm. Self-adhesive tape Kevlar. Suitable for repairing sails, high strength. It can also be used on polyester sails or Mylar sails. Width: 75 mm, Length: 1,5 m.
Two self-adhesive rectangular tapes suitable for repairing large tears; to be applied on both sides of the sail. Width: 24 cm, Length: 37 cm. Special self- amalgamating tape, suitable for sealing the foot mast on sailing boats. 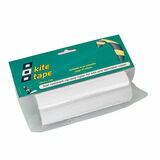 Width: 100 mm, Length: 1,25 m.
Tear-proof self-adhesive tape ideal to repair kite or sheet sails. Apply on the tear so that it doesn't open further. Dimensions: 150 mm x 2,5 m.
High strength self-adhesive tape, suitable for repairing part of sails that are subjected to considerable strains. Width: 75 mm, Length: 1,5 m.
Special clear adhesive tape Mylar for Dacron sails and sails with other type of fabrics. Suitable for repairing sails in a matter of seconds. As well it can be used to repair clear windows on sail boards or surf boards. Width: 50 mm, Length: 3 m.
Special clear adhesive tape Mylar for Dacron sails and sails with other type of fabrics. Suitable for repairing sails in a matter of seconds. 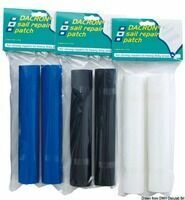 As well it can be used to repair clear windows on sail boards or surf boards. Width: 150 mm, Length: 3 m.
Special adhesive tape Stayput heavy duty. Suitable for repairing sails in a matter of seconds. 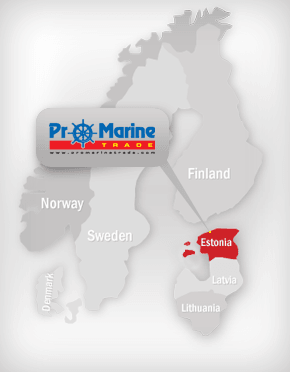 Special high strength version is suitable for sailing boats over 10 metres. Genuine British product. Width: 100 mm, Length: 2 m.
Stayput special self-adhesive tape for quick sail repair. Genuine British Dacron product. Width: 50 mm, Length: 4,5 meters.